100% Renewables in Scotland by 2030: follow-up workshop. 17 June 2014 at the Edinburgh Centre for Carbon Innovation. This exciting event will be the follow-up to An Energy Visioning Backcasting Workshop, held earlier last month. The initial event saw international speakers including Per Lundqvist and Jaco Qist discuss the transition towards a renewable energy future in Scotland as well as the potential for backcasting as a visioning tool for policy-makers. More details for the follow-up workshop will be confirmed in the next few weeks. Carbon Accounting 2014: Cities and Communities Conference. 5 September 2014 at the City Chambers, Edinburgh. 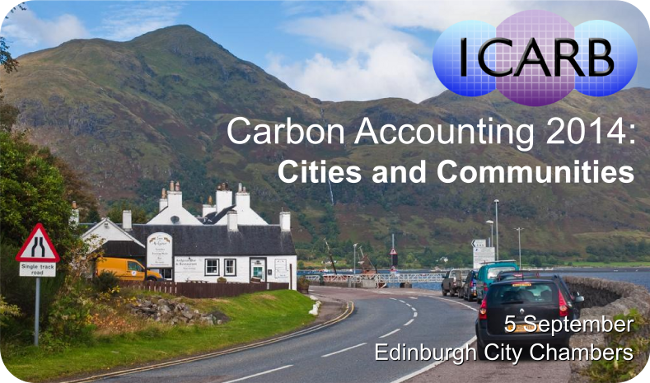 ICARB is pleased to announce that its annual conference will this year be focusing on carbon accounting in cities and communities. The conference will draw on a series of workshops on carbon accounting for cities and communities developed in Spring 2014, and will include presentations from carbon accounting experts. Collected thinking from ICARB’s past events will be revisited, and rules and tools for carbon accounting in Scotland will be showcased. The conference will be the key opportunity in 2014 to learn from, and network with, leaders in the field of carbon accounting, as well community groups from across Scotland who are tackling the challenges of carbon accounting in their local areas. More details of the Interntional Conference will be confirmed soon. This entry was posted in Carbon News, Top news on April 4, 2014 by Ric.